Have you seen this joke making the rounds? It seems like everything is pumpkin spice these days. 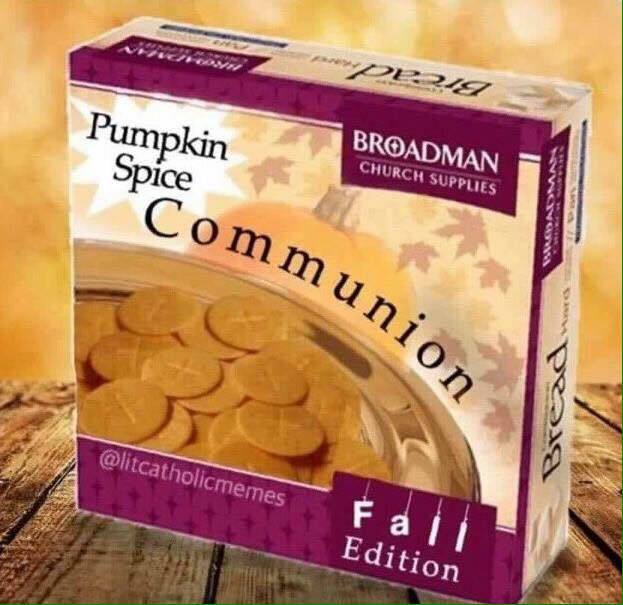 After I was sent this picture no less than three times, I decided I would try to make pumpkin spice bread for communion. I found a recipe on the King Arthur website, but I made a few additions and modifications. I added food coloring to make the bread really orange, changed the recipe because I wanted the fresh ginger to be really smooth, and cinnamon just because. 1. Mix the milk and ginger together in a blender. Then add the pumpkin and vegetable oil. Make sure it is blended really well. 2. Mix together all the other ingredients except the flour. 3. I didn’t have any brown sugar (I never do) but I just mixed regular white sugar and molasses to make it. 4. Add the pureed milk, ginger and pumpkin mixture. 5. Add the flour. You’ll use between 6 and 7 cups. Just use enough to create a soft dough. Knead until the gluten forms and it stops sticking to the sides of the bowl. 6. Cover and let rise 1 1/2 to 2 hours. 8. Divide into two loaves. Since I’m using it for communion bread, I made one boule and one loaf. Bake about 45 minutes at 375 degrees F.
Ideally I would’ve baked the boule for longer since it’s pretty light, but the internal temperature was right (190 degrees F) and we had to go somewhere. They smell delicious! I can’t wait for people in my church to try these!